The sight of flames is what the majority of people envision when they think of fire and fire damage. While the flames do the majority of the visible damage, the residual effects of a fire can be just as damaging. While we are all warned about the dangers during a fire, we are not always told about what happens after a fire. Read ahead and learn more about the fire damage after extinguishing the flames. By definition, soot is a black powdery or flaky substance consisting largely of amorphous carbon, produced by the incomplete burning of organic matter. This carbon powder floats around in the air and settles on anything and everything after a fire. Why is it dangerous? According to the EPA, these microscopic particles can penetrate deep into the lungs and cause a wide range of serious health effects, including premature death, heart attacks, and strokes, as well as acute bronchitis and aggravated asthma among children. As for fire damage from soot to your property, discoloration of porous materials is permanent. If not treated promptly, acidic soot can begin to stain other surfaces as well. Soot is one of the reasons you should never enter a home or business after a fire until the fire department has told you it is safe to do so. All smoke contains carbon monoxide, carbon dioxide, and soot. The fine particles of smoke are able to travel through the respiratory tract until reaching the lungs. This can cause a variety of health conditions such as shortness of breath, respiratory distress, worsening asthma, and heart disease. Again, do not enter a home or business after a fire; wait until it is safe to do so. Within hours after a fire, all of the surfaces in your home or business begin to suffer from fire and smoke damage. Walls turn yellow, wooden furniture may need refinishing; even your clothes can become permanently stained. As stated by the USDA, food in cans or jars may appear to be okay, but if they’ve been close to the heat of a fire, they may no longer be safe. Heat from a fire can activate food spoilage bacteria. If the heat is extreme, the cans or jars themselves can split or rupture rendering the food unsafe. Toxic fumes from a fire can contaminate any type of food stored in pervious packaging (cardboard, plastic wrap, etc.) Therefore, be sure to throw out any food in the refrigerator and freezer, as the seals are not airtight and fumes can enter thus contaminating food. In addition, discard any foods stored at room temperature such as fruits or vegetables, as fumes from the fire or toxic chemicals used by firefighters can contaminate them. As we all know, firefighters us water to put out flames. Water sprayed all over a home or business inevitably soaks even the electrical sockets. 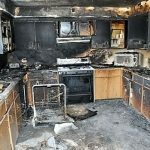 Appliances such as stereos, TVs, toasters, microwave ovens, as well as heating and air conditioning units can all be subject to fire and water damage. Do not turn on any appliances until they are thoroughly cleaned and checked, thus avoiding the risk of electrocution. As soon as it is time to begin cleaning up after a fire, the first call you need to make is to a professional restoration service. Rainbow International Restoration is a 24/7 full-service, IICRC certified restoration company. Their FSRT (Fire & Smoke Damage Restoration Technician) and OCT (Odor Control Technician) certified technicians have years of experience treating fire damaged homes and businesses. The professionals at Rainbow International Restoration document all of your possessions, pre-clean them, and transfer them to their modern contents cleaning facility for final cleaning and odor removal. Your personal belongings are then stored in a climate-controlled, locked vault until you are able to re-occupy your home or business. Once professionally cleaned, your items are delivered directly to you. In the unfortunate event you are the victim of a house or business fire, call Rainbow International Restoration at 877-853-2445 to handle your fire damage promptly and professionally.